The MA in Pastoral Care and Chaplaincy will give you an in-depth understanding of Pastoral Theology as it relates to the goals of chaplaincy and care. The MA in Pastoral Care and Chaplaincy is an Anglia Ruskin University degree created and taught by the Cambridge Theological Federation. 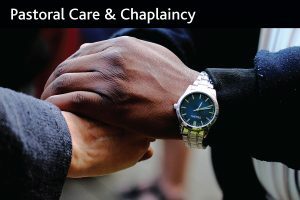 There is further detailed information, including costs and a list of the modules offered, on the MA in Pastoral Care and Chaplaincy Belief page of the Cambridge Theological Federation website.